Hey. Sorry about this, but it looks like this will be another one of those 'one lazy review' months, thanks to way too much work and also having been ill for most of the month. Still, here's a quick review of a renowned classic that I had never really read before. 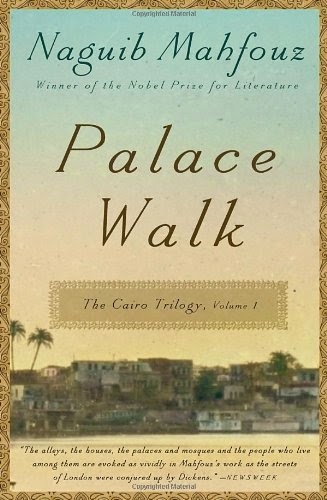 Nobel Laureate Naguib Mahfouz's Palace Walk is the first part of his 'Cairo Trilogy,' a look at the life of a Cairene family set in the period after the First World War. The series itself is considered one of the defining works of 20th century Arab literature, making it a long overdue read for me. This first book introduces us to the family at the heart of the series, led by tyrannical patriarch al-Sayyid Ahmad Abd al-Jawad, who demands complete obedience from his wife Amina, his sons, Yasin, Fahmy and Kamal, and his daughters Khadija and Aisha. Despite his focus on certain traditional values and devotion from his family, al-Sayyid Ahmad himself flouts many of the rules he would insist on from others, engaging in various forbidden pleasures (including affairs with other women). Over the course of the book, the family is affected by a number of incidents, chief among them Yasin's marriage to a woman who subsequently cheats on him, Yasin's own secret adoption of his father's less 'proper' habits, and Amina's injury during an accident and her husband's subsequent decision to banish her for having gone out in his absence. The central event, in a way, is Aisha's wedding, where various plot points converge and several revelations are made. The book is set in 1919, the year the First World War came to an end, and as such the Armistice plays a key role. Post-war tensions lead to political unrest and the rise of a nationalist movement, which Fahmy gets drawn into in opposition to the British occupation, while the rest of the family lives mostly in fear. The placement of a British camp right outside the family's residence complicates issues as well, the juxtaposition of conflicting tensions playing out in an interesting manner. The setting is brought out in a glorious manner, both for Cairo and the time period. Mahfouz masterfully captures a city caught between old and new, East and West, war and peace... If this novel has any failings, it is certainly not in its ability to describe the setting. I'm not sure why it took me so long to read this book, but boy, am I glad I did! I look forward to reading the rest of the trilogy, and definitely feel this book is worth a read.